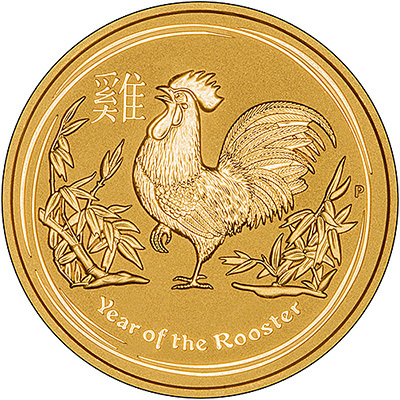 The Year of the Rooster coins were released on 8th September, 2016. * We have large sizes available to order. If you would like to find our more please phone us. The Chinese year 4715 starts on 28th January, 2017 and is the Year of the Rooster. The rooster (or cockerel) is the 10th animal in the 12 animal lunar cycle. Those born under the Year of the Rooster and thought to be confident, honest, hardworking and observant. A rooster is shown on the reverse, amongst some bamboo and leaves. The artist, Aleysha Howarth, designed the coin. The Chinese character for 'Year of the Rooster' can also be seen. 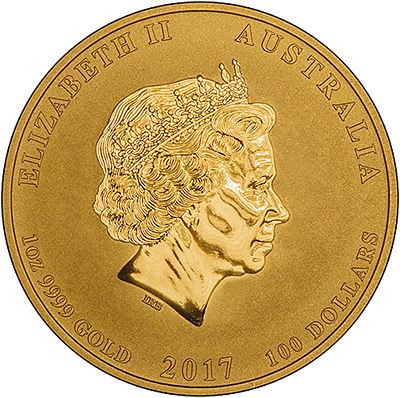 The obverse displays the Ian Rank-Broadley portrait of Queen Elizabeth II. This is the fourth coinage portrait and it appears on the rest of the coins in the series. The one ounce coins have a mintage of just 30,000. The 1kg, 10oz, 2oz, 1/2oz, 1/4oz, 1/10oz, and 1/20oz coins coins will be produced on a "mint-to-order" basis, meaning there is no limit to the amount that will be produced. Once production closes at the end of 2016, the Perth Mint will announce each of the different sizes official mintage figures.